D2Time is happy to receive repairs via post, however we do request that in the first instance the 'Watch Repair Form' is completed and emailed out to us. Once this is received, you will receive a call from a member of our team by telephone to discuss the repairas soon ASAP! 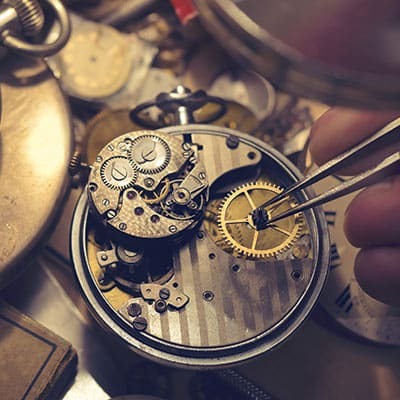 We offer a comprehensive service to cover repairs for all types of watches and is backed up by comprehensive stock of spares to fit many modern watches we receive every day. What Does The Repair Entail? Just like any other machine, it has mechanical parts that require special oils and greases. All full services carried out by our watch technicians are guaranteed for 1 year from the date of dispatch. Our services covers every requirement from a simple battery replacement to a complete service, cleaning or re-movement. Prices excludes spare parts. When having a standard service on your watch, all other repair work including fitting crystals is usually included in the service price unless it is extensive. Case and bracelet cleaning is also included in the price, but not polishing. Water proof testing is included or wet if requested. When we receive your watch, we will examine it and confirm the repair costs by email/phone. We will only undertake the repair once we receive confirmationthat you accept the price, otherwise your watch will be returned to you once a payment of £40.00 is made to cover the estimate, post, packing and insurance. All prices include VAT where applicable. When returning products under warranty, please note that the customer is responsible for the postage return fee unless otherwise agreed in writing by our customer services team. If you are sending in a watch please enclose the 'Watch Repair Form'.